Support/Virtual Server/What is the fullbackup? Use the fullbackup to create a consistent copy of the entire file structure (an image) of your virtual server in its current state. When restoring the virtual server, the image and data of the selected backup is used for the recovery. The server will be in the same state as when the fullbackup was created (system and data). 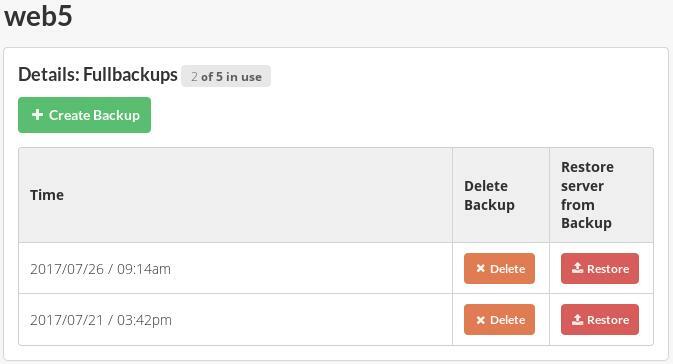 You can choose the maximum number of backups yourself and create or delete them manually at any time. If the maximum is achieved, you can create a new backup by deleting an existing backup or you can order additional number of backups. The fullbackups are maintained until you manually delete them or cancel the option. This feature is available for the Windows and Linux virtual servers. Where is the fullbackup stored? The fullbackup is written to a disk subsystem and not to the disk of the v server. Your disk capacity is therefore not affected by the backups. In addition, two security copies of each backback are created. Hint: To ensure that no data loss (silent data corruption) occurs, the services should be paused briefly. You will get a list of all vServers. 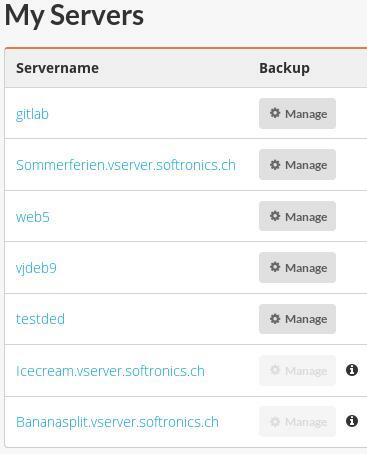 Choose the desired vServer and go to "Manage" under Backup. In the overview you see the number provided fullbackups and the number of possible fullbackups elective vServers. Further every fullbackup is shown with date and time. You can extinguish the available Fullbackups or provide a new Fullbackup. With "Restore" you can restore the vServer with the desired backup.